Lock in a great price for One Room Hotel – rated 8.8 by recent guests! One room hotel is a concept to my knowledge unique in the world: Experience a "Palace" feel in a one-room establishment and where all the staff are entirely at your disposal to make you live an incredible stay. 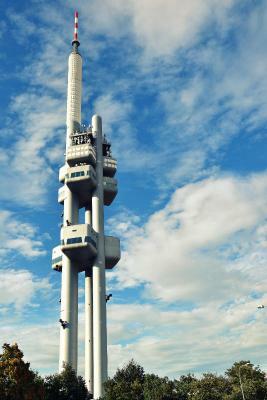 The place is also quite extraordinary set at the top of this immense tower which dominates all the city of Prague, offering you a breathtaking view. The room is superbly equipped, elegantly furnished in a contemporary style. The bathroom is just fantastic. You have a butler and a limousine at your service that turns your holydays into a dream come true. Last but not least, One-room hotel is link to one of the best gastronomic restaurant Oblaca set at the top of the Tower park Praha and to the casual italian restaurant Mimino set at the base of the complex. 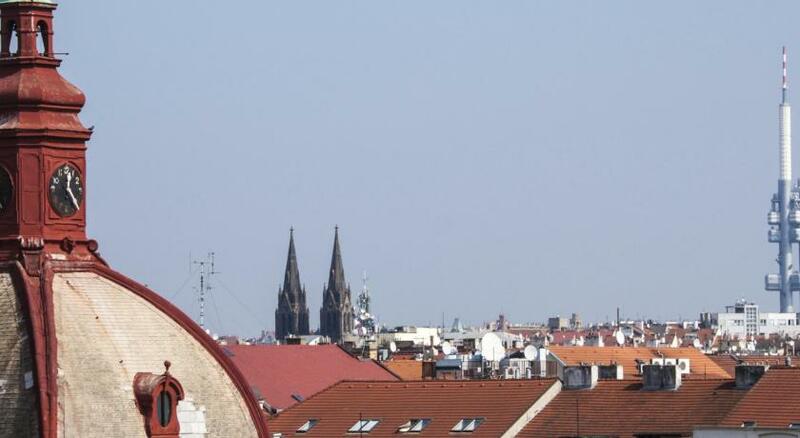 Prague is an very romantic city, if you stay at the One-room hotel, it becomes just magic. The view is spectacular!! Whatever time of day you look out it is amazing. But we discovered that sunrise was the most beautiful and we will never forget this experience. The service was fantastic. We felt very welcome and the extras I ordered were great (birthday cake and breakfast in the room) and the hotel added their own extras for us which was a lovely surprise. Definitely recommend breakfast in the room as this was wonderful while looking out across Prague. We are very much into towers and views but also into Cold War history so we thoroughly enjoyed this stay and would highly recommend it to others. The service was excellent from the moment we checked-in. The staff were great and make us feel comfortable and spoiled at the very same time.Nothing was too much trouble for them. The hotel room was spotless, very spacious and modern with the best bed I have ever slept in. And the unique view! Bathroom was amazing as well, with great shower and bath. Breakfast was very tasty with a lots of various choices. We had a dinner in Oblaca restaurant and the drink in the bar and we could not be more satisfied. The tower is situated in the beautiful park and they have a beautiful garden restaurant which is definitely worth a visit. Very nice, spacious room. Amazing bathroom. And comfy bed. Byli jme velmi spokojeni.Pokoj má impozantní atmosféru a překrásný výhled na město.Personál byl velmi vstřícný a ochotný.Určitě se rádi vrátíme.Měl jsem schůzku se zahraničním obchodním partnerem.Skvělá jídla ,skvělý servis. Vytecne !!! One Room Hotel jsem objednala příteli jako překvapeni . Vše bylo perfektní včetně krásné romantické dekorace. Služba slanění horolezce před okno hotelového pokoje byla jedinečná a přítel byl nadšený! Pobyt jsme si velmi užili a určitě se v budoucnu rádi vrátíme. Od prvního okamžiku jsme se cítili naprosto výjimečně. Byli jsme zde již po druhé a určitě se sem někdy v budoucnu opět vrátíme. Nádherný interiér pokoje umocňuje výhled na Prahu a v kombinaci s luxusní postelí jsme si připadali jako v nebi. Služby byly naprosto perfektní ve všech směrech, nedá se nic vytknout. Bei Prosecco und frischen Früchten die Aussicht genießen-einfach überwältigend ! Pokoj je nádherný a personál velice ochotný. Celkově se překvapení pro maželku hodně vydařilo. Restaurace taky patří mezi špičku. Určitě se sem vrátíme! One Room Hotel This rating is a reflection of how the property compares to the industry standard when it comes to price, facilities and services available. It's based on a self-evaluation by the property. Use this rating to help choose your stay! 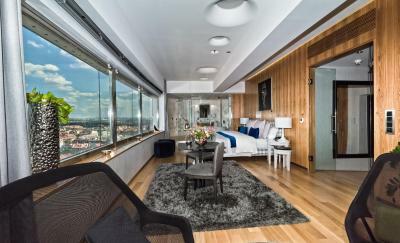 Set in the Žižkov TV tower at 223 feet above ground, One Room Hotel features splendid views over Prague, offering a suite with a glassed-in bathroom with a bath and free Wi-Fi. International à la carte cuisine and drinks are served at the on-site café and bar. The Jewish Cemetary is located next to the One Room, while the statue of Jan Žižka, which is the biggest equestrian statue in Europe, can be found on Vítkov Hill, 0.9 mi away. Guests can choose between free on-site parking or guarded garage parking, which is available at a surcharge. Flóra Shopping Center is 0.6 mi away, while public transport is a 4-minute walk from the One Room Hotel. When would you like to stay at One Room Hotel? House Rules One Room Hotel takes special requests – add in the next step! One Room Hotel accepts these cards and reserves the right to temporarily hold an amount prior to arrival. The tower isn't near anything else so you need to get taxis or public transport to it from the centre. We ordered Uber cars which were not expensive so was ok.